I told wrote a while ago that Chhori was flying for the first time. So here is how her first flying experience went. 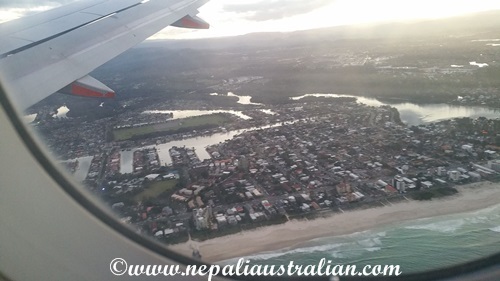 We went to the Gold Coast for a holiday which is about an hour’s flight from Sydney. We were at the airport 2 hours before the flight and checked in our luggage and went straight to the gate. At this stage, we had an hour to kill before would we board the plane. Chhori was OK until we were at the waiting area. As soon as we chose to sit down, she decided that she wanted to walk around and make new friends. Either I or AS was always behind her when she started her adventure. She would just walk around and find a group of people and start interacting. Once, as I was walking behind her, she decided to stop next to 3 ladies who were standing and talking. She just stood next to them and just looked at them and smiled. She behaved as if she knew them. They were super sweet when I apologised and even talked to her for a while. Then suddenly without any reason Chhori decided to move on to another place. This time she found a family with 3 kids siting in the lounge area. The youngest boy was almost the age of Chhori and very shy. The girl who was around 5 years was so into Chhori that she would constantly hug her and touch her despite her mum telling her not to. It was amazing to see how kids make friends so easily. She had fun with this family for a while then she decided that she was done and moved on. Next stop was a woman who was on her own but was eating something. Chhori was too curious and went next to her and just stared at her. I apologised to the woman and tried to move Chhori away but she didn’t want to. So I had to give her biscuits to distract so she didn’t bother the poor lady. Apart from these interactions, she was smiling at everyone and was very curious about everything. She made both AS and me tried by the time it was time to board the flight. 10 minutes before the boarding time she decided she want to breastfeed and I thought that was a better idea than running behind her. So I started to breastfeed and 5 minutes into it she went to sleep. She was still asleep when we boarded the flight and even throughout the whole flight. Yes, she was sleeping until we landed in Gold Coast. I had to wake her up when we landed as it was getting difficult for me to get out of the seat. She was fresh and happy and when we were outside the plane and started walking everywhere again. So on the flight there, AS and I were able to enjoy our meal and talk while she slept on my lap. I have to say it was not expected but definitely a welcome outcome. But on the flight back to Sydney the story was completely different. Chhori decided to go to sleep just after we checked in and was fast asleep for around one hour. Then, around 10 minutes before boarding she woke up. 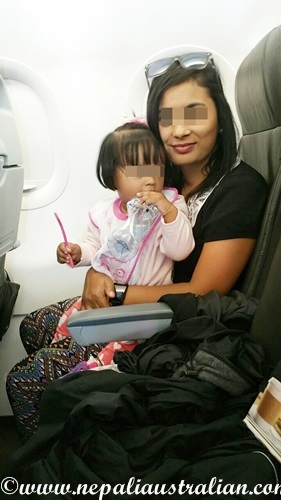 To start with, once we were boarded and seated, she refused to put on her seat belt. All she wanted to do was stand and run around. She finally settled down when we took off. For the next 50 minutes I had to constantly talk with her or get AS involved and I was praying that she wouldn’t cry. I didn’t want everyone to stare at us the whole flight. Luckily there were other babies on the flight and a few of them were crying from time to time. Chhori did cry once when I refused to let her hold the hot tea but she was OK once we turned her tablet on. For the last 30 minutes of the flight she was watching her rhymes. I had to constantly change the rhymes when she decided that she had enough of one but most of the time still she was OK. I was so happy when the pilot announced that we were going to land. Chhori behaved normally on the flight and luckily for us we didn’t have any drama as it was a short flight. We are going to New Zealand in August and the flight will be around 3 hours. I really hope she will be OK on that flight as well because that will be the test flight for our next travel which we are planning, to Nepal. Please share your own adventures of flying with kids or your experience of having other’s kids on board. We are not going to judge you but hope to learn from your experience. 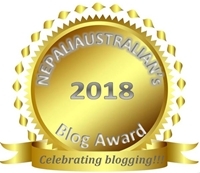 This entry was posted in Australia, Being Mum, Holidays, Our daughter and tagged baby, first flight, flight, flying, holiday, new mum, plane. Bookmark the permalink. First time commenting here. Personally I find the 1-2 year age group the most difficult to handle as they want to keep moving and can’t be tied in a place for too long! The best is if they sleep during the flight, which you can ensure by making them run around a lot before boarding!!! But in case they are awake, you should take some new toys,books and snacks. Ensure the toys don’t have too many bits and pieces that can get scattered all over. I carried stuff like Water Wow, stickers/sticker books, Aqua doodle/ doodle boards on my trip from Sydney to Chennai, when my daughter just turned 2. Good luck on your next trips!